Dinner tonight was very tasty and filling. I had 12oz broccoli, 1 cup yellow squash, 1/2 red bell pepper, 1 Sargento Low Sodium String Cheese, 1/2 cup brown rice and 4oz pork chop. 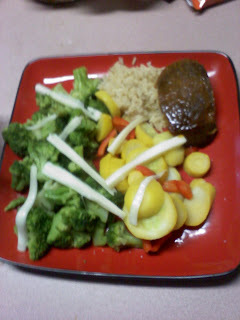 I cooked the pork chops all day in Panda Orange Sauce.